Yesterday, we went to Moto-Zenkoji to make my new spectacle. 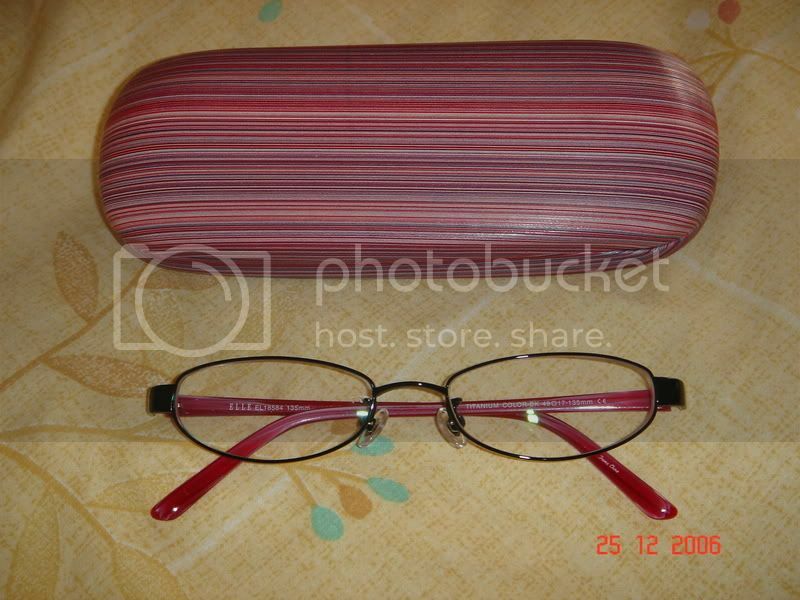 From all the huge varieties of spectacle to choose, I chose one with full frame. 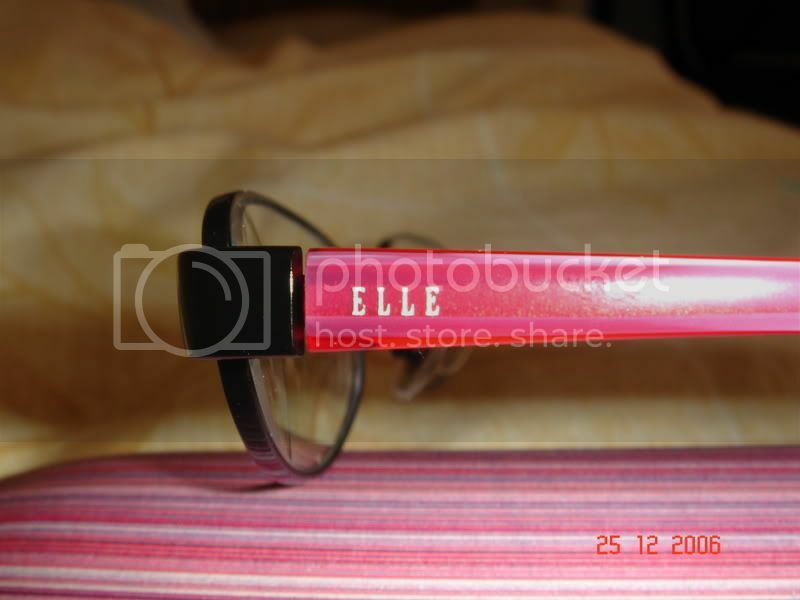 The frame is titanium and the brand is Elle. I can even twist the frame but it won’t break. The color is black and pink. That pretty described the cost already I think. Yup, I was planning to buy only the one with reasonable price but I ended up chosen the one with expensive tag price. Whereas for the lenses, I chose the high vision type lenses which that is the most expensive one. However after all, it all worth it since I use to wear spectacle all the time now and this new one should be tougher too for daily use. I wanted to buy the one with old-school design but that type doesn’t really comfortable to me but the price is quite cheaper. The one which I bought is still with a bit of old-school design anyway. Bie paid the cost which slightly to be similar to the price of my oven hohoho! Thanks a lot dear and he didn’t mind though since the spectacle is a necessary thing for me. I will take care of it with all my heart and soul. Actually I still have a few pair of disposable contact lenses but it is a waste if I use them since I rarely wear them anymore and after one month I will have to dispose and change with the new pair. I decided to wear spectacle full time since because of the just now said reason and I want to take good care of my eyes. Actually it is not so good to wear contact lenses even though I able to take care towards the cleanliness of my lenses but still, wearing spectacle is way much better. Well yup, I do agree sometimes I do feel ugly wearing spectacles; that having something stuck on my nose and leaving my face behind the spectacle. It makes my face feels hidden, not free, or guarded hehehe =P. We also went to a few bookstores to find story books that I have been eyeing since then but unfortunately all of them didn’t sell any English books. 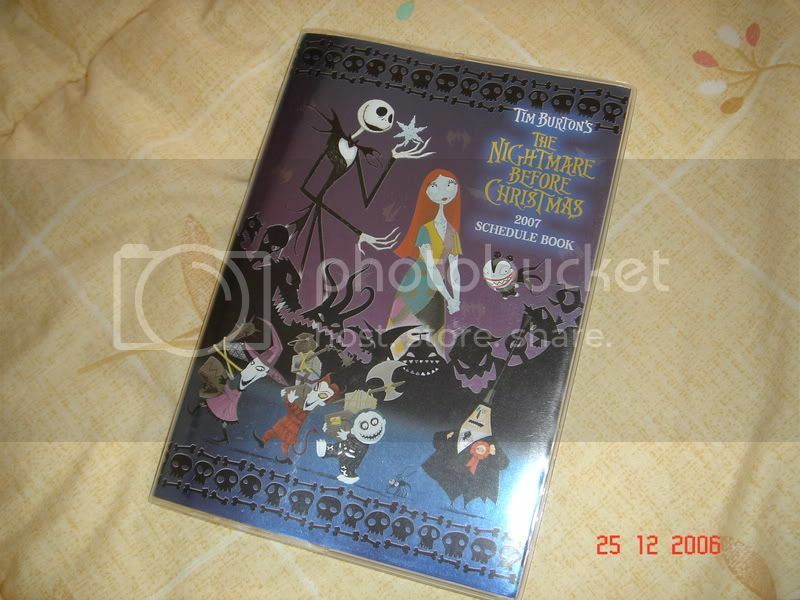 But I got myself a Tim Burtons, The Nightmare Before Christmas 2007 Schedule Book hehehe. I like it okay. There are others like Chip n Dale, Mickey and Minnie, Winnie The Pooh and Donald Duck and Daisy Duck but I think the one I bought is far less childish. Ouhhh it got cute small stickers too! =D After that, we also went to electric and electronics shop since Bie wanted to survey for new hand phone. He planned to change his hand phone and use SoftBank line but the SoftBank phones weren’t that smart in designs. Furthermore he wanted to use his same AU Kddi number, so it was going to be quite a hassle since he has to go to AU shop first and etc. So, at last I suggested him to think first and make a decision later since he wasn’t actually sure himself. Lastly after that, we went to Iida City just because I wanted to go to the Iida Zoo again hehehe! Actually we didn’t know where else to go. There is barely anything in this place we are staying. When we reached Iida station, we met a Malaysian girl who just arrived from Chiba University. She was going to start her practical training in Iida. Bie approached her first by giving salam and she also surprised to meet us, other Malaysian in Iida. She then thanked us for approaching her. After that, we headed straight to the zoo. I like zoo okay and I like to see animals. Even though actually the zoo is very small, the animals are not many and the place was smelly but, I enjoyed it. We were there just for a while, have a window-shopping but didn’t buy anything because nothing interesting caught my eyes, then went back home. All I can say, Sunday is a dating day for high-schoolers in here. Some of them were loitering here and there beside the streets. Just loiter and chit-chat lorrr. Well, same as other places too as well as KL hohoho! I think it is just boring and tiring things to do. Fortunately I didn’t do that during school times since I was in boarding school back then. But I did enjoy shopping and window-shopping, playing bowling (but I watched more than play), trying out eateries, watching movies and so on with my friends during school holidays. HO Ho HO..HO Chin me..mery mery keris emas…biskut mery..bisKuat TIGER..
ada ker ko UGLY pakai specMata.. silap laa Rainning..ko tak pakai pon..UGLY jugak..tak de PRETTY-PreTTy nya…pendek kata..tak mcm pretty ugly laaa…panjang plak kata…mmg ugly ebery tiMe..ho ho ho..ha3..kutuk dia lg..
sepanjang aku hidup..tak penah lg aku beli specMata..so, x bley nk komen laa psL harga dia yg mcm Oben ko tu..ho ho ho skali lg..